Have you seen the "B" puppies yet? They're live on the puppy cam! 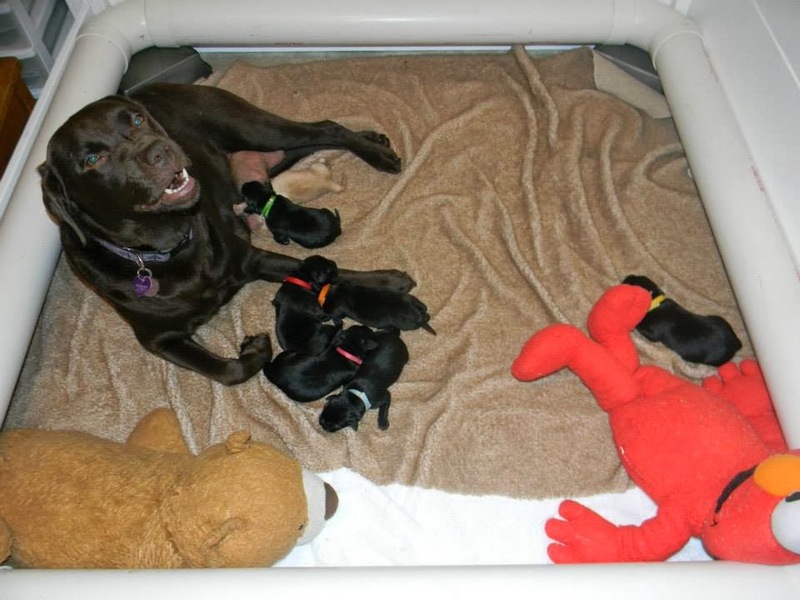 Bea, a beautiful black lab from Guiding Eyes for the Blind, gave birth to her eight puppies on February 23. She had four yellow females, one black female, two black males, and one yellow male. They don't have names yet, but we'll let you know as soon as we finalize them. 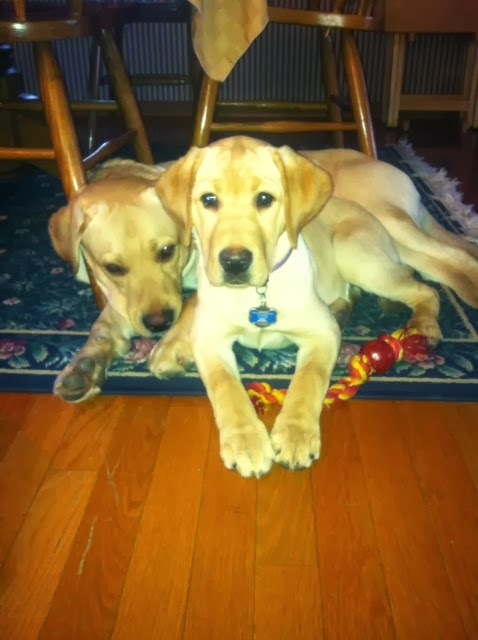 We would like to send a big thank you to Guiding Eyes for the Blind (GEB). Knowing that we need puppies, GEB donated Bea's litter to us! Five of Bea's puppies will stay with us. One of them will go to GEB, one will join the North America Breeding Cooperative, and one will go to the Indiana Canine Assistant Network (ICAN). We hope you enjoy watching the puppies grow! Are you tired of the snow and cold weather and itching to do something fun with your dog? Set your sights on PawsAbilities! PawsAbilities is coming up on March 8-9 and it’s packed full of fun activities for you and your dog. You can compete in the Dog Olympics or try agility. There’s a costume contest, the cutest dog contest, and a parade with lots of great prizes. WestWind Air Dogs is coming, and you’ll be able to try dock diving! They’ll be offering an open swim, so anyone can bring their dog and try it. If you’ve never seen dogs fly, you have to watch the Air Dogs! WestWind Air Dogs is brought to you by WestWind Kennels and Resorts. Flyball Dogs Anonymous will be bringing their energy to PawsAbilities. These dogs are fast! Flyball is a relay where dogs sprint, leap over jumps, snag a tennis ball out of the air, and sprint back to the starting line. Veteran and bestselling author Luis Montalván and his service dog Tuesday will be coming to the PawsAbilities stage, and even better, they’ll be at a VIP brunch on March 9, where Luis will give a presentation. Luis wrote the book Until Tuesday: A Wounded Warrior and the Golden Retriever Who Saved Him. He’ll be signing books both days, although if you come to the brunch, you’ll get to be first in line to meet him and Tuesday and have your book signed. Tickets for the VIP brunch and presentation are $35 and there’s limited seating, so buy yours today! HeRo Canine Consulting will give a demonstration on K9 Nose Work. Brynn, an Australian Cattle Dog mix, will demonstrate a basic container search and show you just how much fun K9 Nose Work can be! The Kid’s Area is going to have lots of new activities. Make sure you bring your kids to check out the fun! We hope to see you and your dogs at PawsAbilities on March 8-9 at the Farm Show Complex in Harrisburg! Visit www.pawsabilities.net for tickets and all the details! Your ticket is good for both days. 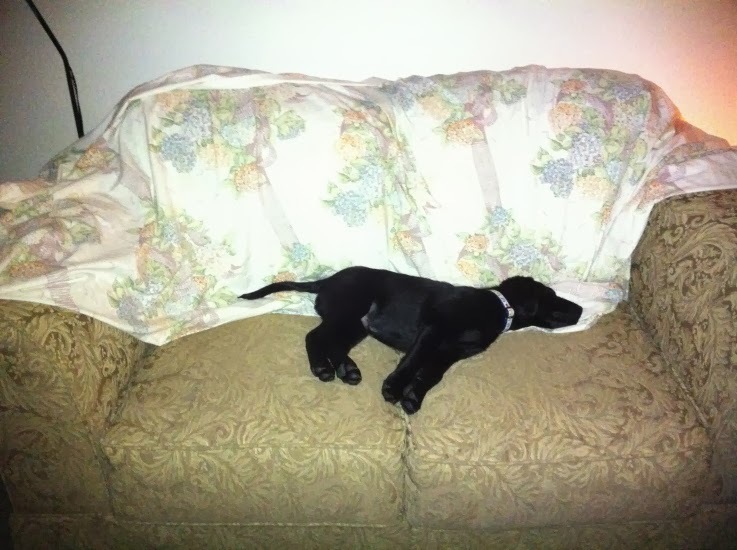 Irwin has a new puppy sister living with him—SSD Carrie Ann from Canine Partners for Life. She’s a young puppy, and Irwin has enjoyed having a playmate to hang out with. They have gotten used to romping around the snow together and just chasing each other around. Before Carrie, Irwin tended to stay with his puppy raisers, never leaving their side. Now, there have been times when he and Carrie are just hanging out together at night. Irwin also loves showing off to Carrie and showing her what he knows. He has learned that all he has to do is steal one of Carrie’s toys and start running around, and she will start chasing him. He loves it when she chases him around! He is also doing very well in advanced training and is learning lots of new behaviors. He enjoys running around with the other dogs in advanced training and playing with them every morning. He has missed some training recently because he was neutered and needed to rest for two weeks. He’s all healed up now, though, and you can’t even tell that anything has happened. He’s still his energetic and happy self. The two weeks he was healing were tough for him because he’s so used to being active, but he got through it. Both he and Ryan, his puppy raiser, are happy about that! Right now, Irwin is set to go to Team Training in October. Keep up the good work, Irwin! We all know it takes a village to raise a child, but in the past few months SSD has elevated that sentiment. PADS Abby and her ‘A’ litter demonstrate that perhaps it’s more like a small town or city to birth and raise seven service dog pups. 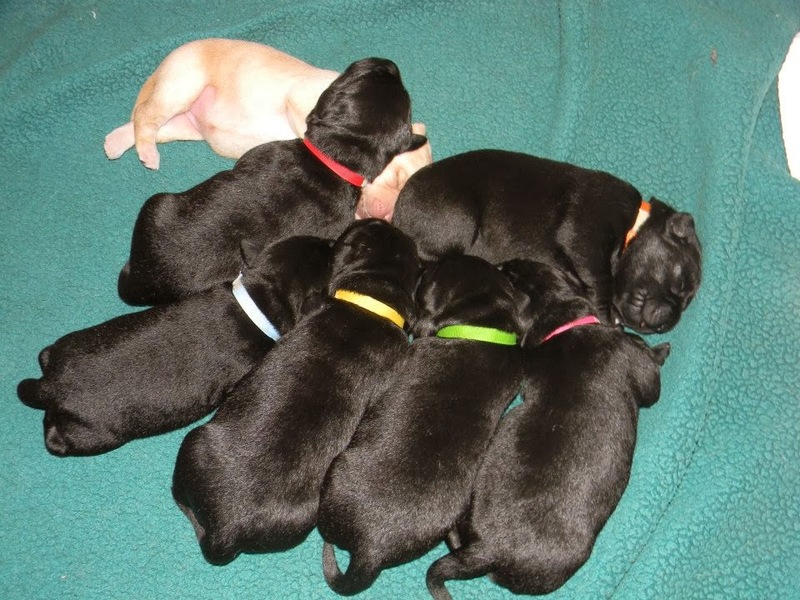 It all started with the new Assistance Dogs International (ADI) program, known as the North America Breeding Cooperative (ABC) program, where assistance dog programs share their breeding stock to help everyone diversify their genetic pool and the type of dog each program needs. Nancy Fierer was on the original committee that worked hard to figure out the many angles of the program. Included in this is Marina Phillips, in California, of the Phillips Next Generation consulting firm. She knew that Pacific Assistance Dog Society (PADS) in Vancouver, Canada (see, it has gone international! ), had a lovely breeding dog named PADS Abby. She has had two litters and is housed by Cory Patterson when not on maternity leave. She came to SSD to whelp, via US Airways and Amanda and Becky [SSD’s Training Coordinator and Puppy Coordinator] in October. Abby went to stay with Crystal Garman and her daughter Alicia and there whelped her pups at her home in early November with the aid of the SSD whelping team of Diane Bohenick, and the SSD staff of Amanda, Becky and Ryan. Then when the puppies were two weeks old, Abby and her seven pups moved homes to Bill & Susan Tyson where they spent the next eight weeks. They were hugged and handled by many folks interested in helping them on their road to being service dogs. One hundred people of all ages from 18 months to 85 years hugged the puppies! They came from the Philadelphia area, Washington DC, Spain, California, and all of central PA. Thanks to Peter and Betsy Smith for all the newspapers all flattened and rolled up; Sandy Smith for the delicious dog treats; Jane Seymour for the many paper towels; Mary Duval and Ciara for all the doggie massages and clean-ups; and the gang that handled the pups at their first vet visit at the Palmyra Animal Clinic: Jane Jackson, Ciara Capilletti, Steve Doyle, Kate O’Farrell, and Sharon Kemble. A few days before Christmas, three of the pups became lethargic and sick, necessitating a quick trip to the closest emergency animal clinic (remember just like kids, puppies don’t get sick Monday through Friday during regular working hours!) The staff at Willow Mill Veterinary Hospital gave superb care to the three pups, who, being babies, made a quick recovery in a couple of days. Thanks to Dr. Nancy Dreschel of the Animal Science Department at Penn State; Katie Grube, a junior, spent a week at the Tyson home helping with the litter, which was especially wonderful since the pups all developed an intestinal bug and there were days with some late nights of worrying. A recent Penn State Animal Science graduate, Lauren Applegate, also came and spent the day caring for the pups that did not go to the vet. When the pups were all feeling well again, Katie and Lauren helped with early clicker training and a trip in public to Wal-Mart and Wendy’s. All the SSD pups made a visit to the veterinary ophthalmologist at the Veterinary Referral Center in Malvern PA when they were seven weeks old where they examined by Dr. Brady Beal and her staff. 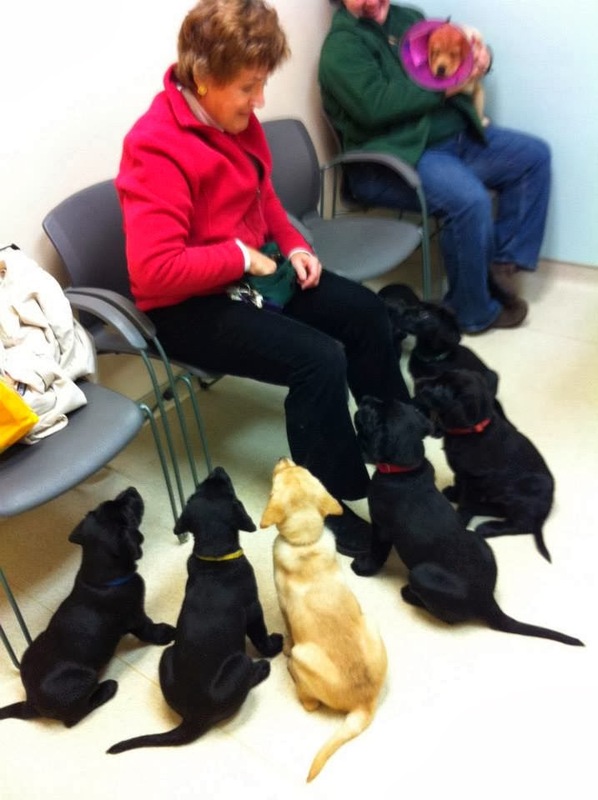 The day long trip needed helpers—imagine taking seven pups, plus SSD Olympia, to the vet! Assisting Becky were Nelda Wachtman, Carol Nesbitt, and Susan Tyson. The ‘A’ litter pups are now in puppy raiser homes. One pup is being raised by Service Dogs of Virginia. Thanks to Carol Nesbitt for transporting the puppy. Two puppies are being raised in Massachusetts by a program called NEADS. One more item of business before the story ends: the mother, PADS Abby, will be transported back to Vancouver, Canada via the generosity of a US Airways employee, through US Airway’s program called Puppies in Flight.